From the leading expert in FODMAPs and IBS, this is the complete guide and cookbook for overcoming IBS by discovering your dietary triggers and building a personalized, doable, and fulfilling diet around nutritious, delicious foods that let you finally feel your best. Patsy Catsos, MS, RDN, LD, pioneered the use of the low-FODMAP diet to find your unique FODMAP fingerprint when she self-published IBS--Free at Last!, ushering in a new era of treating IBS through diet instead of medication. Written for the layperson to use at home, her book quickly established itself among doctors and other specialists as an invaluable tool for anyone suffering from IBS, Crohn's disease, ulcerative colitis, SIBO, and gluten sensitivity. This new, definitive edition offers the theory along with a program that walks you through eliminating FODMAPs (difficult-to-digest carbohydrates found in a variety of otherwise healthy foods) and adding them back one by one--the most usable, thorough program available. And its 56 delicious recipes and comprehensive guides to high- and low-FODMAP foods make this the bible of the low-FODMAP lifestyle. Here is your plan for eating well while finally feeling great. Got IBS? Feeding somebody with IBS? Got a family to please? We’ve got you covered, from the lunch-box to the briefcase; from the picnic to the dinner party; from after-school snacks to dessert. If you are using the FODMAP approach to manage your IBS symptoms (or your child’s), learning a few new tricks in the kitchen can make all the difference. Lisa’s step-by-step recipes, tips, time-savers and substitutions will give you more confidence in the kitchen and impress your taste buds! Patsy and Karen contribute their clinical and nutrition expertise, with information you need about FODMAPs and nutrition, when a low-FODMAP diet is appropriate, and how to avoid common pitfalls of eating for IBS. Lisa Rothstein is the recipe developer on the team, drawing on her 20 years of experience as a mom, home cook and gluten-free baker. 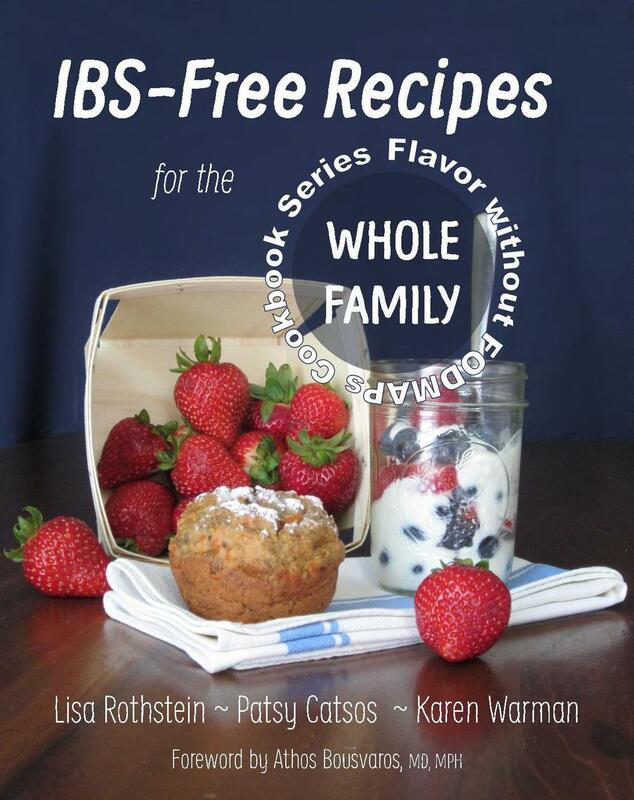 Patsy Catsos, MS, RDN, LDN is a registered dietitian nutritionist and the author of IBS—Free at Last! and the Flavor without FODMAPs Cookbook. Karen Warman, MS, RD, LDN is a pediatric dietitian at Boston Children’s Hospital. What's inside: Tips and precautions for using the FODMAP approach with children; Menus for breakfast, lunch and dinner; Snack ideas; Lists of low-FODMAP foods (updated 9/2015); Flavor without FODMAPs in over 110 recipes; Low-FODMAP versions of family favorites. Would it make life easier to have a cookbook laser-focused on your low-FODMAP diet, with recipes you don't even have to think about? If you are using the FODMAP approach to manage your irritable bowel syndrome (IBS), this cookbook is the one! You can enjoy the recipes in this collection with no modification, no regrets and no apologies, whether you are feeding the family or entertaining. 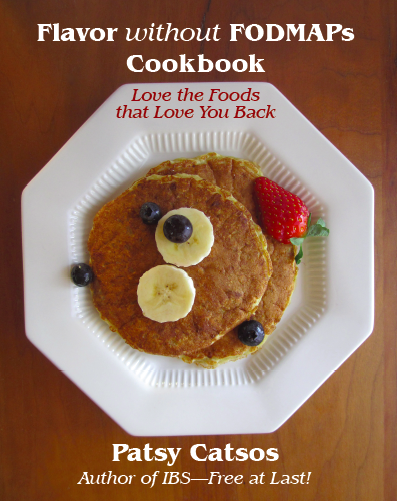 Patsy Catsos, best-selling author of IBS-Free at Last!, shares tools with you including: 122 flavorful recipes, each one suitable for a low-FODMAP diet and made with whole, real foods; lists of high- and low-FODMAP foods and ingredients, based on the latest research; everyday and special occasion menus; recipe modification tips. If you've struggled to cook without wheat flour, onions, garlic, pasta, bread, canned chicken stock, and bottled salad dressings, this book will set you free!